In a blatant plug for the Reagent Guide, each Friday I profile a different reagent that is commonly encountered in Org 1/ Org 2. Version 1.2 just got released this week, with a host of corrections and a new page index. Note: there should also be another exciting announcement about the Reagent Guide coming up in the next little while or so… more details to come! What it’s used for: NaNH2 is a strong base and excellent nucleophile. It’s used for deprotonation of weak acids and also for elimination reactions. Similar to: LDA (lithium diisopropylamide). As a strong base, NaNH2 will deprotonate alkynes, alcohols, and a host of other functional groups with acidic protons such as esters and ketones. It is also a very strong nucleophile. As a base, it’s often used in situations where a strong, small base is required. 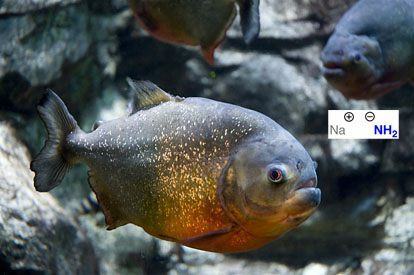 Like a piranha, NaNH2 is small, fast, and has razor sharp teeth, and can find its way into tight, enclosed spaces. One common application of NaNH2 is in the deprotonation of alkynes to give so-called “acetylide” ions. These ions are excellent nucleophiles and can go on to react with carbonyls in addition reactions. A second application of NaNH2 is in the formation of alkynes from halogens. Treatment of either geminal dihalides (i.e. – two halogens on one carbon) or vicinal dihalides (halogens on adjacent carbons) with NaNH2 (2 equiv) will result in the formation of alkynes. 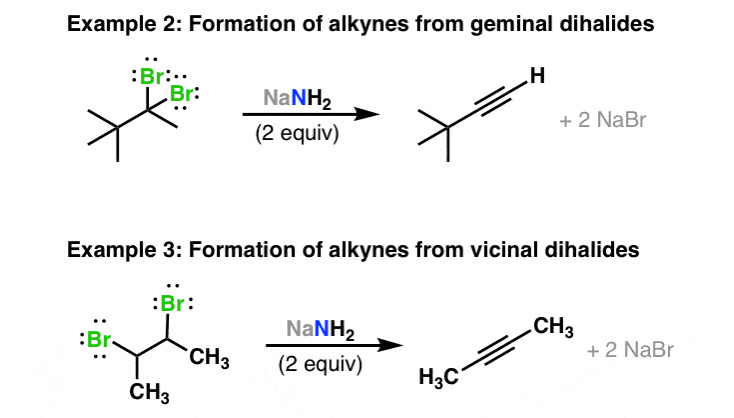 Since vicinal dihalides are easily made by the reaction of alkenes with halogens such as Br2 or I2, this is a useful way of converting alkenes to alkynes. Deprotonation of functional groups such as OH and even alkyne C-H should hopefully be straightforward, but the use of bases to make alkenes may require some explanation. This is what is known as an elimination reaction, in that the elements H and Br (in this example) are removed in order to form the alkene. Specifically, this is an example of an E2 reaction. P.S. You can read about the chemistry of NaNH2 and more than 80 other reagents in undergraduate organic chemistry in the “Organic Chemistry Reagent Guide”, available here as a downloadable PDF. Furthermore, since NaNH2 is a strong base, it has the significant disadvantage of promoting side reactions from elimination (this can occur when attempting an SN2 with NaNH2 as the nucleophile, for example). Therefore, it is generally wise to avoid using NaNH2 as a nucleophile in organic synthesis. Sodium azide (followed by reduction) is the usual substitute. The best short summary of NH2- in solution I’ve found. Just wanted to let you know I’m refeerencing this page in my Honours paper. God bless you and Canada. THANK YOU SO MUCH. Your website is probably the most useful orgo website on the damn internet. I was trying to figure out how to use this stupid reagent for hours because my book doesn’t explain “how” it works and every other website just uses a ton of complex terminology to explain a simple concept. A lot better than my Klein textbook which took 10 or so pages to give a detailed reason as to why this happens instead of just being straight forward. Why NaNH2 is called as Sodamide even though it does not contain amide group? “Amide” can be confusing. It can refer to either C(O)NH2 or NH2(-) . The name “Sodamide” comes from shortening the name SODium AMIDE. can you help me with the mechanism for the conversion of acyl halides to amides? NH2- adds to the carbonyl carbon. Then, the oxygen lone pair re-forms a pi bond to the carbonyl carbon, leading to loss of the halide as a leaving group. Addition elimination. Is sodamide the same as a sodium metal and liquid ammonia reduction? No, the sodium in a liquid ammoniua reduction is sodium metal (Na). Sodamide is NaNH2. Could you please tell me why is HgSO4 used in organic chemstry? ?Is it an oxidising agent or reducing one?? Moreover what is its action upon alkenes, carbonyl compounds and acids?? sir I want to ask if we use nanh2 with alkyl halide then substitution because of strong nucleophile should occur then why there is elimination. Thanks for this breakdown on this reagent. I was so confused on how to use something that’s a strong base AND a strong nucleophile, but your description of why NaNH2 is better served as a base really helped me out. Is it possible for the base to deprotonate both sides of acetylene since there are two acidic hydrogens present? Or do we just assume one mole and treat it as an SN2 reaction. I’d assume that it deprotonates just one side of acetylene (1 mol of base) and reacts with CH3I to make 1-propyne. I find it odd that NaNH2 can both react with an alkene to form an alkyne but ALSO react with an alkyne to form an acetylide anion. Since this is the case, if I reacted an alkene with excess NaNH2, wouldn’t the excess NaNH2 react with the alkyne I just created to form an acetylide anion? This seems like it would be an issue in cases of synthesis problems if I am not mistaken. Any insight would be greatly appreciated! YES – you are absolutely correct. When forming a terminal alkyl through elimination, in practice one must use 3 equiv of NaNH2 because if only 2 equivalents are used the reaction doesn’t go to completion. Many instructors/schools are inconsistent on this point, and just mention “2 equiv” but you are absolutely correct. Honestly, I really wish I had found this website earlier instead of 3 days before my final. These are by far the clearest and most helpful explanations I’ve ever found. Thank you!! R-CH2-C≡CH instead of R-C≡C-CH3. If this is true, why doesn’t NaNH2 react the same way as alcoholic KOH ? This summary for Sodium Amide (NaNH2) is amazing! Thanks a lot! I wish to ask if there is a way to determine which reaction (Sn2 or E2) will a Sodium Amide (NaNH2) go though when comes to a primary alkyl halides? We know if you have for example 1,2-dichlorobutane(Vicinal) reacts with three molar equivalents of NaNH2 in liquid ammonia then protonate, you will get an alkyne. But it seemed a bit odd when Sodium Amide (NaNH2) goes through Sn2 when treated with for example 1-Bromoethane which gives secondary amine and then finally quaternary ammonium. I’m also confused when Sodium Amide (NaNH2) seems to prefer Hofmann other than Zaitsev elimination even encountered with Vicinal alkyl dihalides to form alkynes. does sodium ethoxide (NaCH2CH3) has the same role as NaNH2, since they both can remove a halogen and for a pi bond instead ? PS: awesome website, it is very helpful !! I think example 2 is a bit misleading. Although two equivalents of NaNH2 can result in some of the alkyne, it is more typical to use three equivalents because NaNH2 can deprotonate the acetylenic proton. This distinction is only for terminal alkynes. Internal alkynes do not have this proton. What about the reaction of the sodium amide with a phenol? 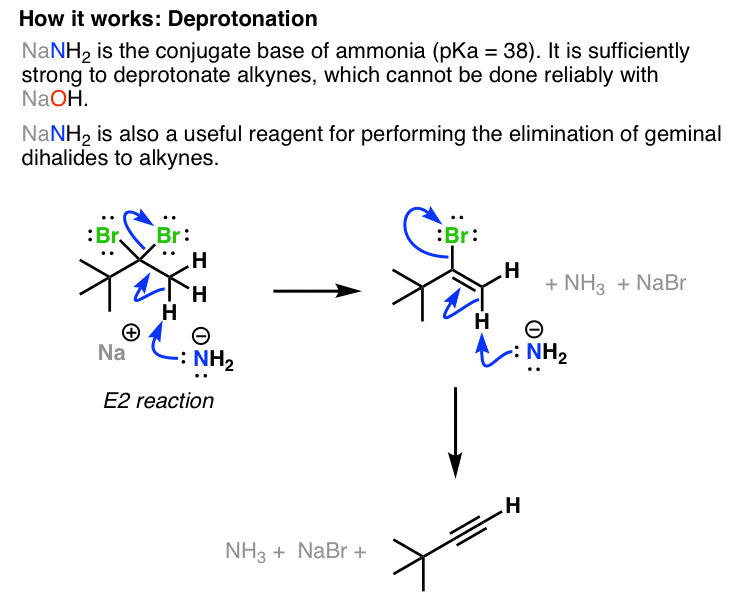 Deprotonation takes place?